Tailored for today's busy clinician, Clinical Sports Medicine provides hands-on information for the management of both recreational and competitive athletes. Over a thousand full-color clinical illustrations plus a wealth of summary boxes enable you to obtain key information quickly, while authoritative text written by established and emerging authorities provides state-of-the-art know-how on overcoming any challenge in the specialty. Coverage of sports injuries includes structured information on diagnosis, management, and rehabilitation. 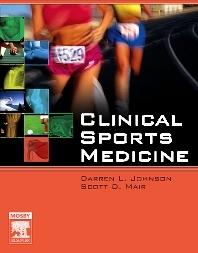 Uses 1,150 full-color photographs, including a wealth of arthroscopic images, to vividly depict a full range of conditions and techniques. Summarizes information in a systematic way using color-coded sections. Integrates basic science information throughout, focusing on knowledge directly relevant to clinical practice. Addresses operative management of sports injuries as well as non-surgical aspects such as nutrition, co-existing medical conditions, rehabilitation, and more. Incorporates numerous algorithms to facilitate decision making. Covers both general rehabilitation principles and rehabilitation of specific injuries, and provides return-to-play guidance for both you and your anxious patients. Includes treatment recommendations for both competitive and recreational athletes, ranging from adolescents to late middle age. Presents authors' pearls and pitfalls for effective treatment.